As promised by HIRA, here is our best solution to clean up City Hall in 2016. 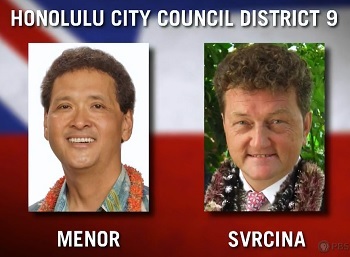 The ONLY anti-rail, anti-tax, anti-HART candidate for City office on the ballot this year is Mililani's Emil Svrcina. 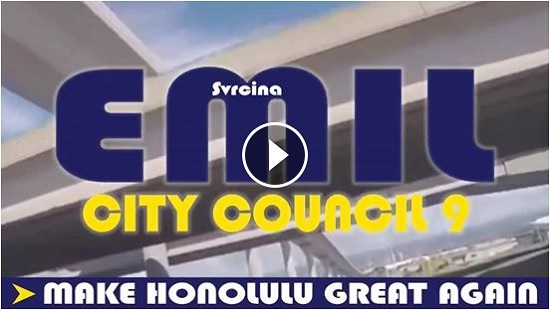 With the determination to "Make Honolulu Great Again," Emil is running for the Honolulu City Council's 9th District (Mililani, Waikele, Waipahu, Village Park, Royal Kunia, and Ewa Beach). Not a RINO by any stretch of the imagination, Emil is a forceful, full-spectrum conservative who brings a crystal clear understanding of good vs. bad, right vs. wrong from his life experience as a political refugee who escaped Czechoslovakian communism twenty-seven years ago to come to this country. That was 1989 - the same tumultuous year when the Berlin Wall came down and Eastern Europe's Iron Curtain underwent a heavy dose of 'glasnost' and 'perestroika'. That time in history was supposed to be when big government ideologues like Emil's opponent Ron Menor learned the hardest lesson of all -- how socialism is unsustainable (because you eventually run out of other people's money and deprive them of too much freedom). But Menor and other the big government advocates -- Democrats and enabler RINO's alike -- won't understand that lesson until Honolulu becomes the next Detroit, with all of the massive debt carried by the City and the State. But 'life experience' isn't all that Emil brings to the equation. He's a computer specialist, programmer, and analyst at the UH Cancer Center, a scientist, a researcher, and has a Masters Degree in Nuclear Science and Physical Engineering. Most of all, Emil is a patriotic American and family man. Please kokua by spreading the word to everyone you know in Emil's district in Central and West Oahu. Please forward this email to them and urge them to vote for Emil. You can also donate directly to Emil's campaign as the secure website HERE . For extra motivation, take a look at HIRA's recent video about Emil's opponent HERE . Ron Menor's policies and votes are a complete disaster for Oahu residents. For more information about Emil and the other candidates HIRA is helping in 2016, please read our latest newsletter on that subject . Finally, please support Emil Svrcina for City Council . Now's your chance to help elect the right kind of leader at Honolulu Hale. We've been waiting a long time for Sam Slom to get some company with another truly conservative Republican in office. Emil is the kind of city councilman we need at Honolulu Hale. He will vote the RIGHT way on the issues and say what needs to be said; especially on those issues which Republicans and conservatives and taxpayers care about the most. Thanks for your help in turning Blue Hawaii into a Red State in our lifetime. Best wishes for success to all genuine Republican candidates in 2016!